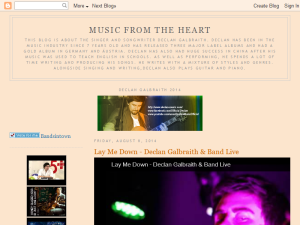 This is a fan blog dedicated to promoting my favorite singer and songwriter named Declan Galbraith. Here you will find pictures, videos, songs, interviews, performances, bio and news about him. You can also listen to all his songs and appreciate his talent and his wonderful voice. This what your Music From The Heart Blog Ad will look like to visitors! Of course you will want to use keywords and ad targeting to get the most out of your ad campaign! So purchase an ad space today before there all gone! If you are the owner of Music From The Heart, or someone who enjoys this blog why not upgrade it to a Featured Listing or Permanent Listing?